This year’s annual display of Perseid meteors is the most favourable for several years. The peak numbers occur at new Moon, which means that the skies should be particularly dark. 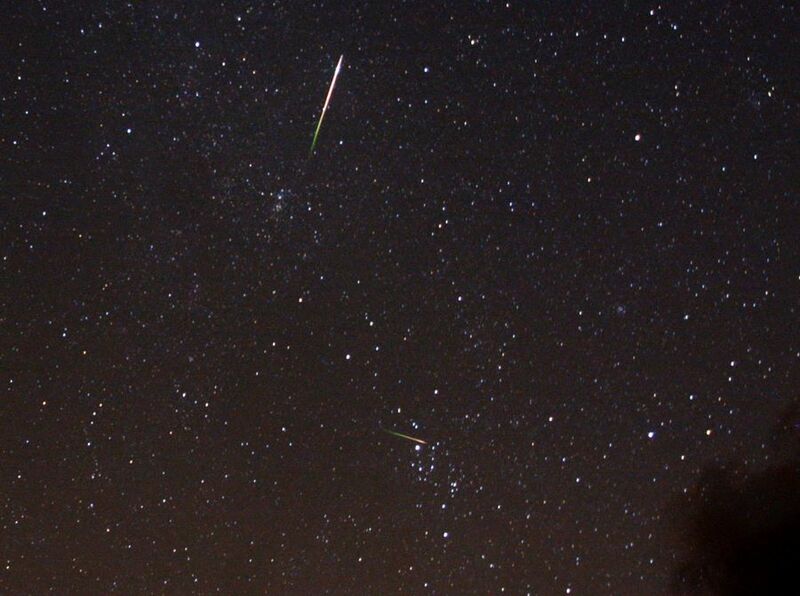 August is always a great month for watching shooting stars – what astronomers call meteors. You can expect one every ten minutes or so on most nights, as long as you have a fairly dark sky. Around Sunday 12 August we get the annual Perseid meteors, which are one of the year’s strongest showers, and they should be worth staying up late for – if the clouds keep away, of course. But by late, we do mean late. It doesn’t get really dark enough to see them until about 10.30 pm, and then the rates start to increase until about 3.30 am! But don’t be fooled by it being August. It can still get pretty cold in the UK in August, so grab a blanket or two to keep yourself warm. There won’t be any moonlight at all this year, as the Moon nearly new, so skies will be good and dark if you’re well away from streetlights, which will help you see the fainter meteors. The Perseids don’t just appear in Perseus but can appear anywhere in the sky. They appear to come from the direction of Perseus in the north-east. However, that’s not the best direction to look. Set yourself up looking at a part of the sky about 40º away from Perseus, and about 50º above the horizon to get the best chance of seeing one. Anywhere in the UK will do, but try and get away from as many lights as you can. You may hear that there could be 80 an hour visible, but don’t take that too seriously. That’s a theoretical number based on perfect conditions, which won’t apply. You might see one every few minutes, though there are sometimes bursts of activity with a few in a single minute. What causes this sky spectacular, and why does it occur at the same time each year? Shooting stars are caused by tiny grains of dust – actually the debris from comets – in orbit around the solar system. When one of these tiny grains hits the Earth’s upper atmosphere, which is usually at a speed of many kilometres a second, it disintegrates in a burst of light. Around 12–13 August we run into a somewhat denser stream of these particles, giving enhanced numbers. You can find out a lot more about what to do when you see one in our guide to observing meteors. And there’s a 35-minute video (recorded in 2013) telling you all you need to know about observing the Perseid meteors.